Should you consider changing your office cleaning service? What are the most important factors to consider when looking for quotations? We have compiled a list of items to consider to make it easy for you the decision maker. Does the cleaning service provider have references of current or past clients? Are you dealing with a registered business? Do a CIPC search to confirm registration or request the registration documents. Do you require a VAT registered cleaning service or not? Should you choose to make use of a VAT registered provider then make sure they are in good standing with SARS. Does the cleaning service provider belong to the NCCA? 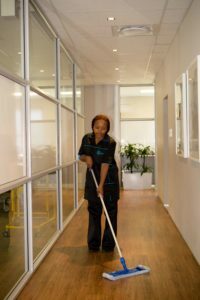 Always ensure that the cleaning service provider pays their cleaners the minimum wage or more than what is required by the Labour department. Do all their cleaners belong to a provident fund? By law this is a requirement for all South African cleaning services to provide their staff with a provident fund. Half is paid over by the company and the other is a deduction from the employee. Does the cleaning service provide a cleaning checklist to ensure that all areas of your office or building is cleaned and signed off. Does the cleaning service provider offer weekly site visits by their Management team to ensure that the cleaning service is being carried out to the client’s satisfaction? Be sure to check that the cleaning service provider is insured. Another important item to consider is how long has the cleaning service been in business? Have you checked Hello Peter to see if they have good or bad reviews? Should you require more information or would like to evaluate your cleaning service requirements for your office cleaning service, building or retail store, do not hesitate to contact us.